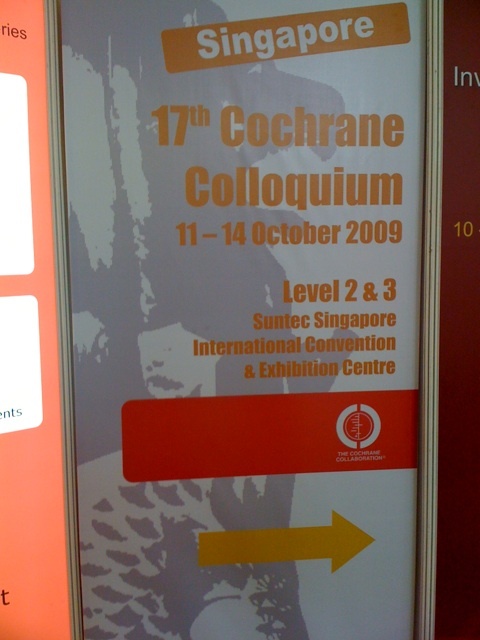 Last week I attended the annual Cochrane Colloquium in Singapore. I will summarize some of the meetings. Here is a summary of an interesting (parallel) special session: Creating a closer working relationship between Cochrane and Guideline Developers. This session was brought together as a partnership between the Guidelines International Network (G-I-N) and The Cochrane Collaboration to look at the current experience of guideline developers and their use of Cochrane reviews (see abstract). Emma Tavender of the EPOC Australian Satellite, Australia reported on the survey carried out by the UK Cochrane Centre to identify the use of Cochrane reviews in guidelines produced in the UK ) (not attended this presentation) . Pwee Keng Ho, Ministry of Health, Singapore, is leading the Health Technology Assessment (HTA) and guideline development program of the Singapore Ministry of Health. He spoke about the issues faced as a guideline developer using Cochrane reviews or -in his own words- his task was: “to summarize whether guideline developers like Cochrane Systematic reviews or not” . Keng Ho presented the results of 3 surveys of different guideline developers. Most surveys had very few respondents: 12-29 if I remember it well. Each survey had approximately the same questions, but in a different order. On the face of it, the 3 surveys gave the same picture. others have no access to it. 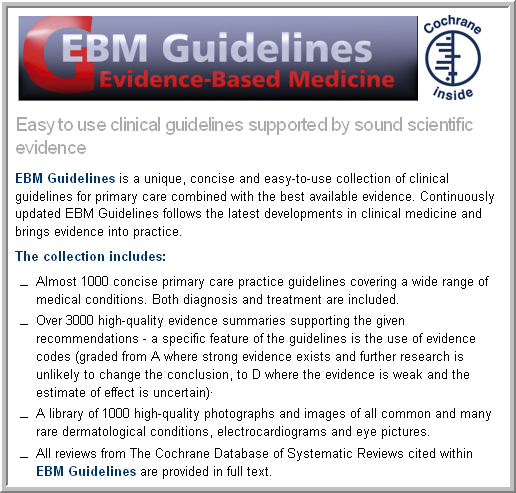 most importantly they actually did use the Cochrane reviews for most of their guidelines. An often heard critique of Guideline developers concerned the non-comprehensive coverage of topics by Cochrane Reviews. However, unlike in Western countries, the Singapore minister of Health mentioned acupuncture and herbs as missing topics (for certain diseases). This incomplete coverage caused by a not-demand driven choice of subjects was a recurrent topic at this meeting and a main issue recognized by the entire Cochrane Community. Therefore priority setting of Cochrane Systematic reviews is one of the main topics addressed at this Colloquium and in the Cochrane Strategic review. Kay Dickersin of the US Cochrane Center, USA, reported on the issues raised at the stakeholders meeting held in June 2009 in the US (see here for agenda) on whether systematic reviews can effectively inform guideline development, with a particular focus on areas of controversy and debate. The Stakeholder summit concentrated on using quality SR’s for guidelines. This is different from effectiveness research, for which the Institute of Medicine (IOM) sets the standards: local and specialist guidelines require a different expertise and approach. All kinds of people are involved in the development of guidelines, i.e. nurses, consumers, physicians. What to do if there is no evidence? Guidelines differ, including the rating of the evidence. Almost everyone in the Stakeholders meeting used GRADE to grade the evidence, but not as it was originally described. There were numerous variations on the same theme. One question is whether there should be one system or not. Another -recurrent- issue was that Guidelines should be made actionable. 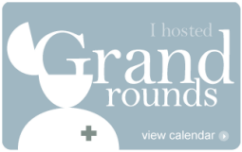 Gordon Guyatt, McMaster University, Canada, gave an outline of the GRADE approach and the purpose of ‘Summary of Findings’ tables, and how both are perceived by Cochrane review authors and guideline developers. Gordon Guyatt, whose magnificent book ” Users’ Guide to the Medical Literature” (JAMA-Evidence) lies at my desk, was clearly in favor of adherence to the original Grade-guidelines. Forty organizations have adopted these Grade Guidelines. Grade stands for “Grading of Recommendations Assessment, Development and Evaluation” system. 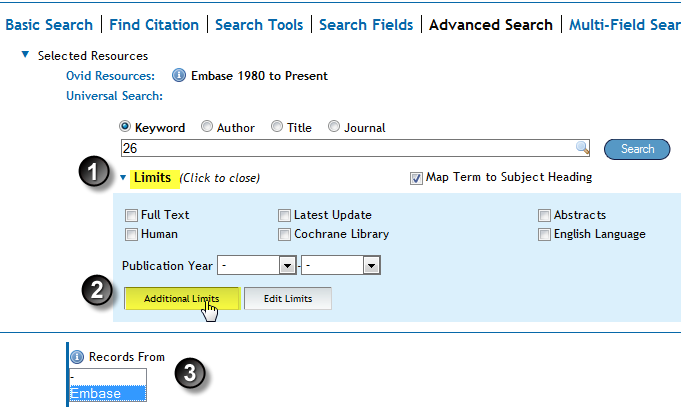 It is used for grading evidence when submitting a clinical guidelines article. 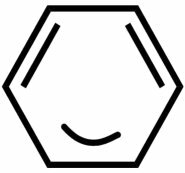 Six articles in the BMJ are specifically devoted to GRADE (see here for one (full text); and 2 (PubMed)). GRADE not only takes the rigor of the methods into account, but also the balance between the benefits and the risks, burdens, and costs. Suppose a guideline would recommend to use thrombolysis to treat disease X, because a good quality small RCTs show thrombolysis to be slightly but significantly more effective than heparin in this disease. However by relying on only direct evidence from the RCT’s it isn’t taken into account that observational studies have long shown that thrombolysis enhances the risk of massive bleeding in diseases Y and Z. Clearly the risk of harm is the same in disease X: both benefits and harms should be weighted. Guyatt gave several other examples illustrating the importance of grading the evidence and the understandable overview presented in the Summary of Findings Table. Another issue is that guideline makers are distressingly ready to embrace surrogate endpoints instead of outcomes that are more relevant to the patient. For instance it is not very meaningful if angiographic outcomes are improved, but mortality or the recurrence of cardiovascular disease are not. GRADE takes into account if indirect evidence is used: It downgrades the evidence rating. Downgrading also occurs in case of low quality RCT’s or the non-trade off of benefits versus harms. Guyatt pleaded for uniform use of GRADE, and advised everybody to get comfortable with it. Although I must say that it can feel somewhat uncomfortable to give absolute rates to non-absolute differences. These are really man-made formulas, people agreed upon. On the other hand it is a good thing that it is not only the outcome of the RCT’s with respect to benefits (of sometimes surrogate markers) that count. Indeed, many people talk about their findings and/or recommendations being evidence based, because “EBM sells well”, but upon closer examination many reports are hardly worth the name. First I gave an introduction into Medicine 2.0 and (thus) Web 2.0. Chris, Web Operations Manager and Information Architect of the Cochrane Collaboration, talked more about which Web 2.0 tools were already used by the Cochrane Collaboration and which Web 2.0 might be useful as such. What is the worst thing that happened to you (regarding web 2.0)? Chris and I thought a long time. Chris: that I revealed something that wasn’t officially public yet (though appeared to be o.k.). Me: spam (but I remove it/don’t approve it). Below is my presentation on Slideshare. The (awful) green blackgound color indicates I went “live” on the web. As a reminder of what I did, I included some screendumps. The current workshop was just meant to introduce and discuss Medicine 2.0 and Cochrane 2.0. I hope we have a vivid discussion Wednesday when the plenary lectures deal with Cochrane 2.0. I think it would be good when these points are taken into account during the Cochrane 2.0 plenary discussions. 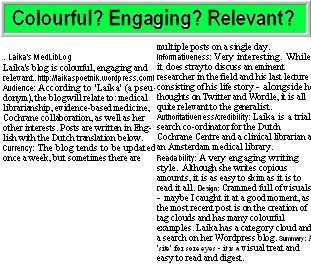 This week I will blog from…..
Chris and I will facilitate a web 2.0 workshop for the Cochrane (see here, for all workshops see here). 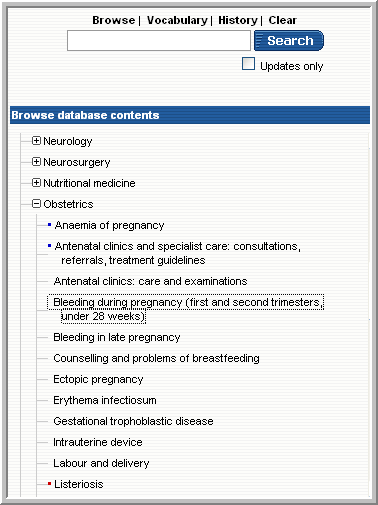 The entire program can be viewed at the Cochrane Colloquium site. inserting ourselves into the ‘conversation‘”. The session has the promising title: The Cochrane Library – brave new world? If you don’t have Twitter you can add your comment here and I will post it for you (if you leave a name). Thanks for all who have contributed so far. *this is only for our small-scaled workshop, I propose to use #CC2009 for the conference itself. As many readers may already know, the Cochrane (CC, Cochrane Collaboration) is an international not-for-profit and independent organization, dedicated to making up-to-date, accurate information about the effects of healthcare readily available worldwide. It produces and disseminates systematic reviews of healthcare interventions and promotes the search for evidence in the form of clinical trials and other studies of interventions (see Glossary). The yearly Cochrane Colloquium is meant for members of the CC, and those interested in the organization. To go to the individual virtual items you can click one of the items above. You can also go to “Welcome” by following this link and go to the Virtual Colloquium. It is easier to switch to another item from there. It should be noted that there is also a lot uncovered by the virtual media: the meetings and workshops (of course), as well as the (non plenary) oral sessions and even the very interesting opening session with the following speakers: Gerd Antes (German Congres Centre), Tikki Pang (WHO) and Pekka Mustonen (Duodecim). An overview of the colloquium program can be found here.